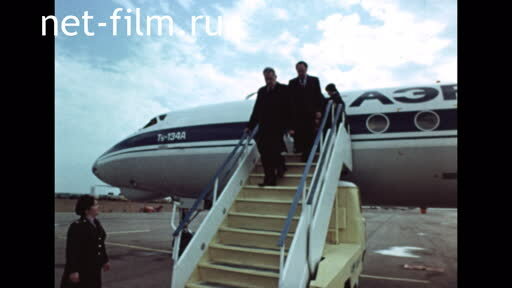 Kunaev DA and accompanying persons go down the ladder. Scene №2 Kunaev DA in Karaganda, part 2. 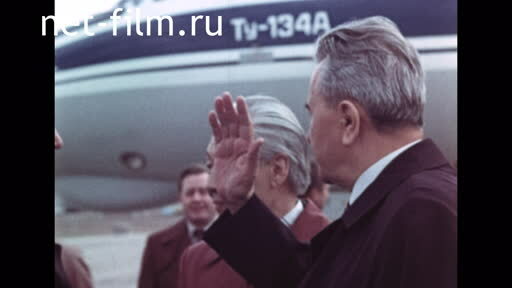 Kunaev DA at the airport communicates with those who meet. Scene №3 Kunaev DA in Karaganda, part 3. Encountering Kunaeva DA in an Aeroport. 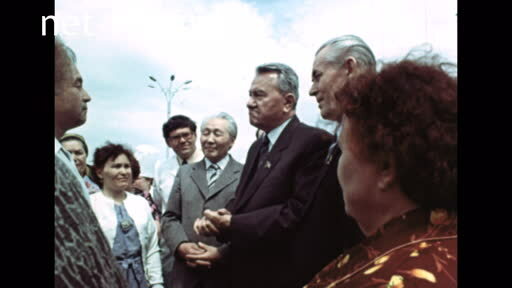 Scene №4 Kunaev DA in Karaganda, part 3. 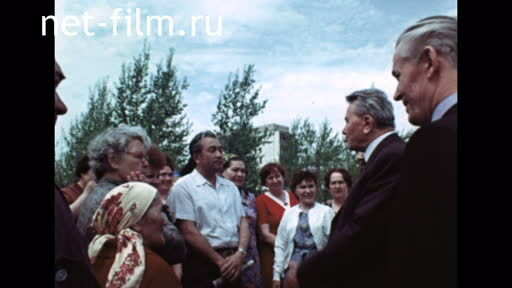 Pioneers give flowers to Kunaev DA. 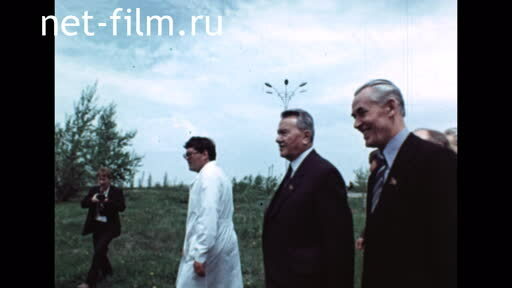 Scene №5 Kunaev DA in Karaganda, part 4. 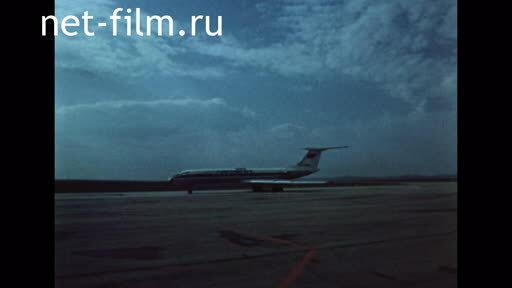 Scene №6 Airport, plane TU-134 A.
Karaganda, Airport, plane TU-134 A. 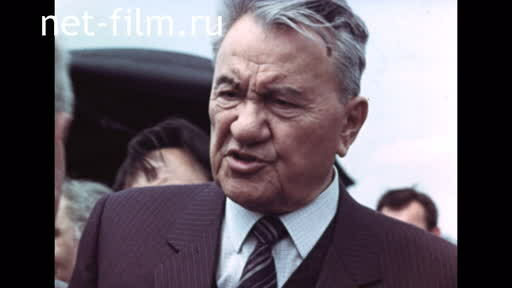 Scene №7 Kunaev DA in Karaganda, part 5. 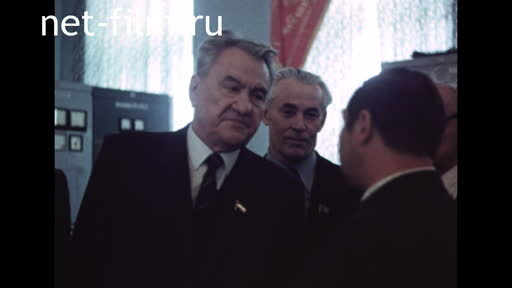 Scene №8 Kunaev DA in Karaganda, part 6. Scene №9 Kunaev DA in Karaganda, part 7. 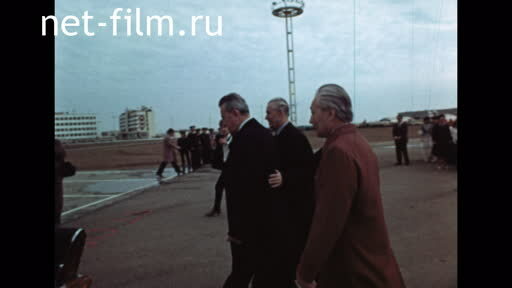 Kunaev DA and the persons accompanying him. Scene №10 Kunaev DA in Karaganda, part 8. 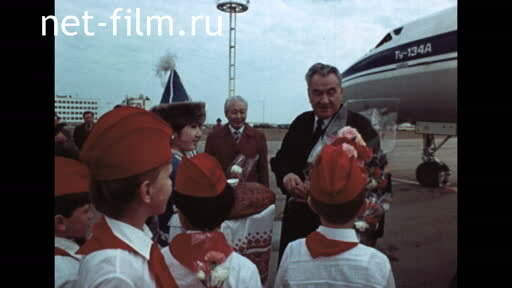 Kunaev DA at the airport he greetes with those who meet. 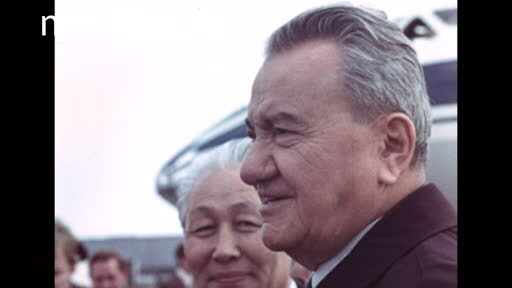 Scene №11 Kunaev DA in Karaganda, part 9. 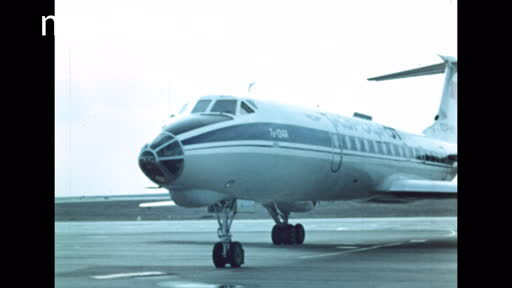 Karaganda, the airport, on the strip TU-134 A. 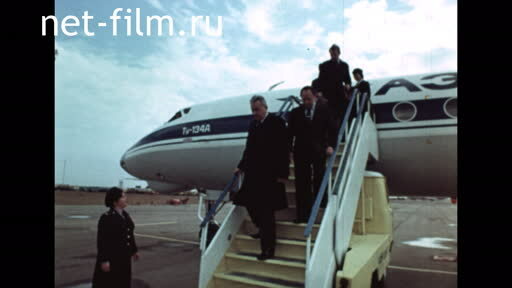 Scene №13 Kunaev DA in Karaganda, part 10. 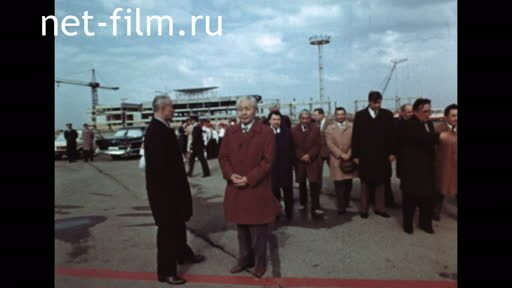 Scene №14 Kunaev DA in Karaganda, part 11. 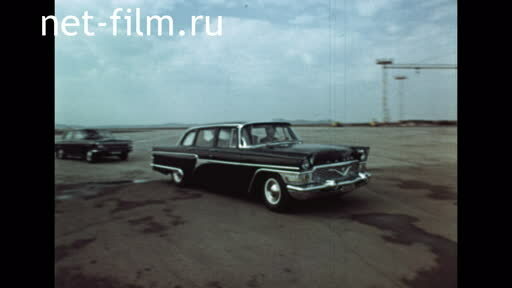 Airport, Kunaev DA goes to the car "Seagull" and sits down in the car salon. Scene №15 Motorcade of the Seagull. Kunaev DA rides in the car "Seagull". 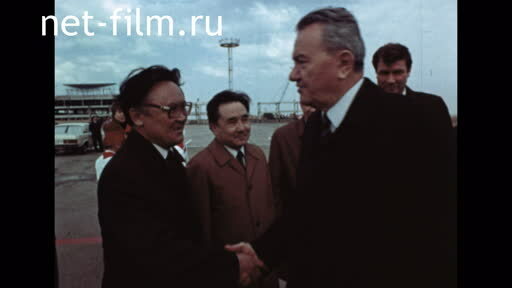 Scene №16 Kunaev DA in Karaganda, part 12. 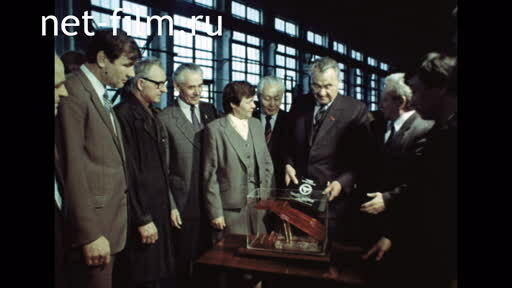 Kunaev DA and the persons accompanying him at the factory. 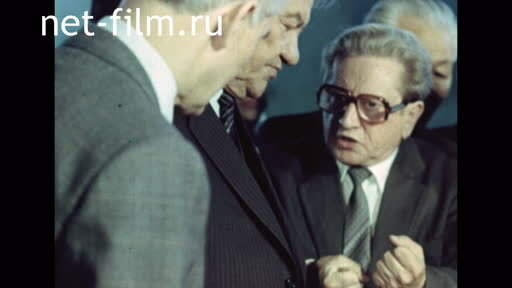 Kunaev DA looks at the samples of products. Scene №17 Kunaev DA in Karaganda, part 13. 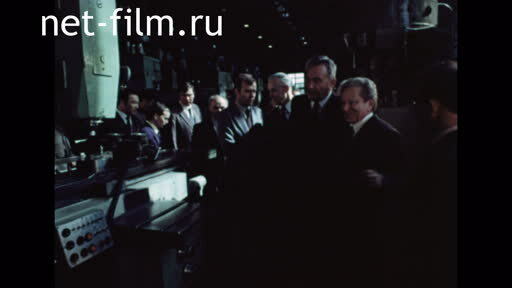 Kunaev DA and the persons accompanying him near the milling machine. Scene №18 Kunaev DA in Karaganda, part 14. 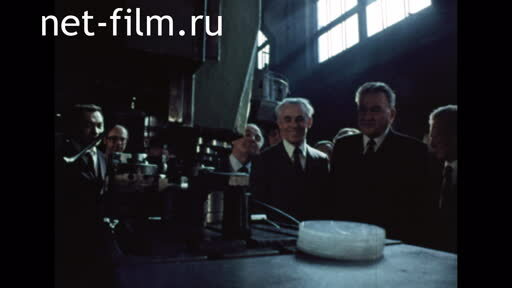 Kunaev DA looks at the samples of the plant's products. Scene №19 The milling machine is working. The milling machine is working. Scene №20 Kunaev DA in Karaganda, part 15. Scene №21 Kunaev DA in Karaganda, part 16. Scene №22 Kunaev DA in Karaganda, part 17. 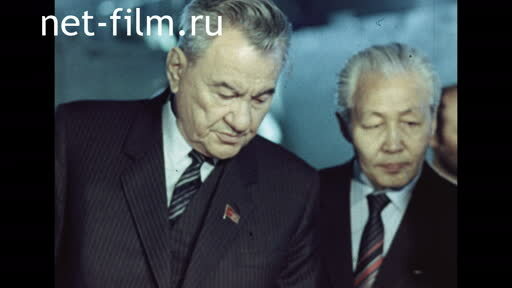 Kunaev DA communicates with the management of the plant. Scene №23 Kunaev DA in Karaganda, part 17.